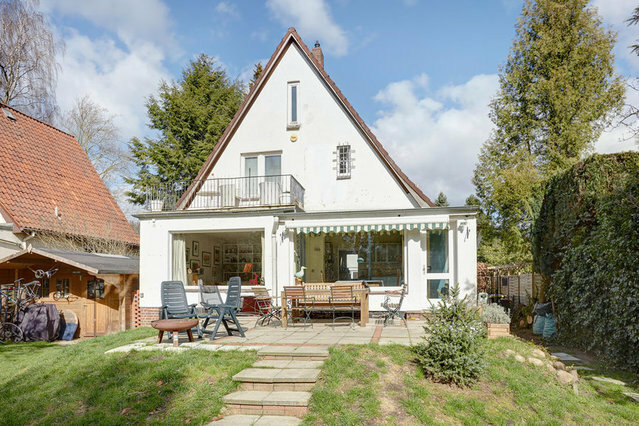 This neat single-family house was built in 1933 on a plot of approximately 1,393 square meters in a popular residential area of Wellingsbüttel. It was built in solid construction and in recent years constantly renovated and modernized, so that it presents itself in a well-kept condition. The appealing white plaster facade on a red brick base is completed by white wooden windows with double glazing and welcomes the visitor in a friendly way.The ground floor leads through a porch in the large living hall with staircase and a fireplace, which ensures a cozy comfort on cool days. The adjoining kitchen has been open plan to the small extension with dining area, from here you have access to the front terrace overlooking the beautiful, large property with optimal south-west orientation. The large living area extends over the entire length of the house, the rooms are flooded with light through large windows. The space on the ground floor is rounded off by a guest toilet.The upper floor has a bathroom with window, a bedroom with balcony and two inter-connecting rooms. A space-saving staircase leads to the developed loft. All living rooms have beautiful, old herringbone parquet floors in combination with Hamburg baseboards that make lovers' hearts beat faster. The plank area contains Solnhofener tiles.The detached house has a basement, so that a laundry room, a boiler room with external access and sufficient storage space are available. A garage completes this magical real estate offer. Finally, we would like to point out that an extension of the house to the south would be conceivable.